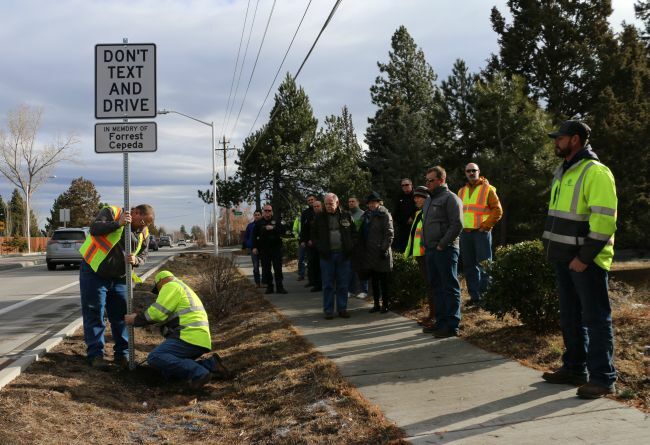 BEND, OR -- Bend city crews installed a “Don’t Text and Drive” sign on Reed Market Road, Friday, to honor the memory of a 16-year-old hit by a driver who was texting. In 2011, Forrest Cepeda was killed while riding his bike on Reed Market, near Pettigrew. Police hope the sign will help discourage distracted driving. Bend PD Sgt. Eric Hagan says the agency averages more than 500 cell phone-related tickets and warnings a year. According to the National Highway Traffic Safety Administration (NHTSA), nearly 3,500 people were killed by distracted driving in 2015, nationwide, and 391,000 were injured. Bend’s City Manager granted an exemption to the city’s rules for road-side memorials to allow the sign.